Sorry I've been MIA, but I'll be back to crafting this weekend - promise! Meanwhile, I wanted to post a picture of my very 1st fondant cake. I have very much enjoyed class, and last night was the last day - so this is my final project! Enjoy!! Wow! I can tell you passed. I love the Zebra stripes. 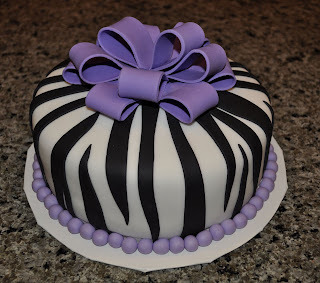 I take it the purple pearls at the base are fondant also? The bow looks hard to make. Don't it collapse? Don't you wish I would stop asking so many questions and just tell you how pretty your cake is? Ok, your cake is very pretty....seriously, it is. Wow! That's just beautiful! AWESOME job!!! Hi Sue! Thanks! lol I don't mind the questions at all! The pearls are also fondant - I rather pipe them on, but unfortunately I didn't have any buttercream on hand. The bow is really not as hard as it looks - and if you let the fondant harden before putting it together, it's very stiff and will not colapse. That is soooo cute! I am making my first "fancy" cake for my niece's birthday on Sunday and I am making my first fondant decorations...I'm shaking in my shoes! Wow!! !I love the zebra cake. You did a great job!!! WOW!!! This is so cool. I have been thinking about thanking cake decor classes and now I want to even more. Great job. Where did you take your class? The zebra cake is great ! !